Dragon Jackpot is a randomly activated 4-level progressive jackpot feature that is available in Dragon Jackpot Roulette and 2 Playtech slots: Nian Nian You Yu (9-line) and Fei Cui Gong Zhu (20-line). 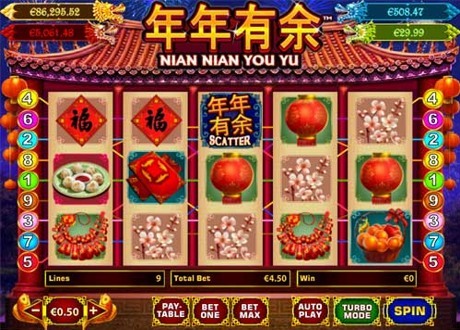 Nian Nian You Yu is a 5 reel and 9 payline slot game with Oriental theme, bonus feature and 4 Dragon progressive jackpots. The name translates approximately as "plenty of fish". Winning symbols are related to theme and include Chinese characters, flowers, a Chinese lantern, firecrackers, food, a table, some fruit and 2 ornamental dragons. The purple dragon is the most valuable icon in the game as he can pay you 10,000x your line bet for five on an active payline. The big Red Koi fish is Wild symbol and it will substitute for all symbols including the scatter. Koi fish appears only on reels 2, 3 and 4 and it will double any wins to which it contributes. The scatter is a group of characters which translates as Nian Nian You Yu. RTP is rather high for this game: 97,03%. Fei Cui Gong Zhu is another online slot from Playtech with an oriental theme offering Dragon jackpot. The slot has 20-payline format and also offers 10 Free Spins and "pick-a-prize" Secret Garden Bonus game. The Wild symbol is a Japanese girl and she substitutes for all others except the Scatter (a red temple) and the Bonus icon (a green temple). Dragon Jackpot Roulette: Progressive jackpots and massive multipliers make for a wilder richer roulette experience. Place Bonus Bets for a chance to enter the Dragon Bonus and win up to 744 times your bet! Win 1 of 4 Dragon progressive jackpots from any spin. Game RTP alters from 96.02% to 97.30%.